Three Teams Advance to the Asia Pacific Finals of the FedEx Express/Junior Achievement International Trade Challenge. 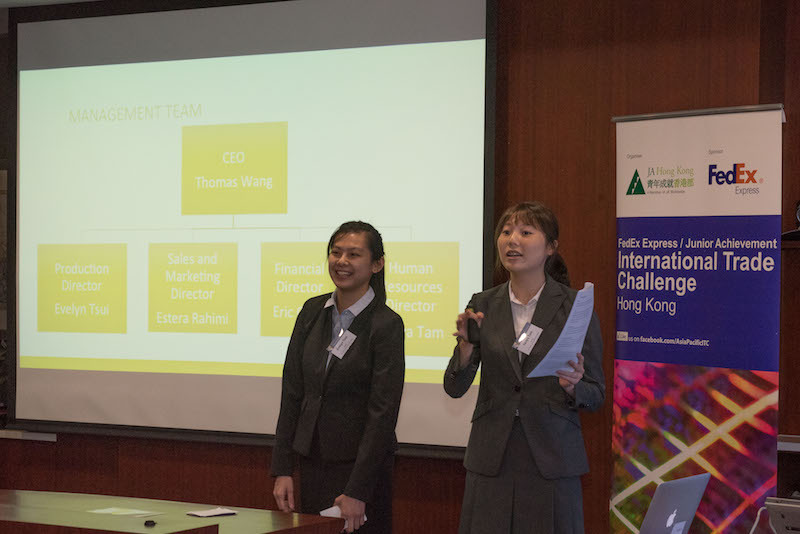 Three student teams demonstrated entrepreneurial excellence with their winning business strategies to enter the home fitness market in Iran at this year’s FedEx Express/Junior Achievement International Trade Challenge (FedEx/JA ITC) Hong Kong Final. These students will represent Hong Kong in competing with 42 counterparts from seven other Asia Pacific markets, namely Japan, Korea, Malaysia, the Philippines, Singapore, Thailand and Vietnam at the Asia Pacific Finals, set to take place in Hong Kong during August 7-11. Team DOTS, Evelyn Tsui and Tanya Tam from St. Paul’s Co-educational College decided to sell treadmill, mil and relaxation mat to Iran. Traditionally Iranians have high consumption of carbohydrates from kebab, rice and bread. The selection of home fitness products will provide convenience to exercise indoor while eliminating the discouraging factor of hot climate. 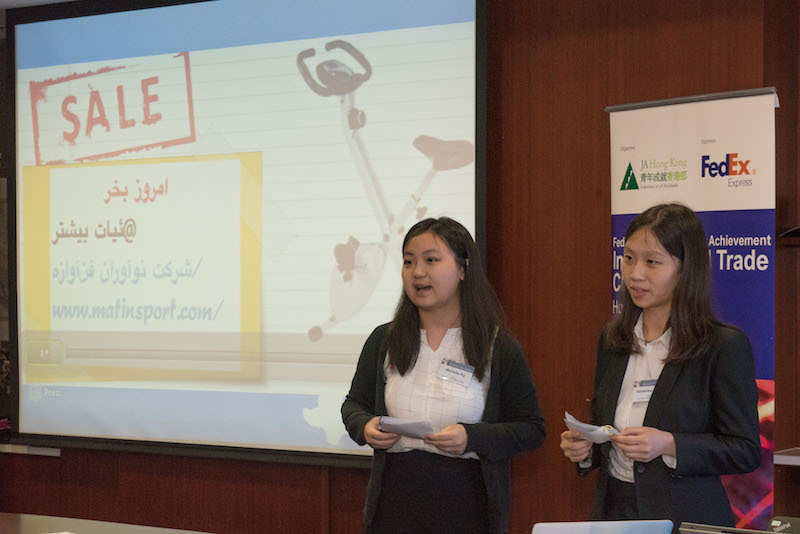 Team LOHAS, Michelle Ng and Vanessa Kwang from St. Paul’s Co-educational College came up with a Premium Foldable Fitness Bike, aiming to raise health awareness and cultivate a good habit of exercising among Iranians. The compact and portable fitness bike is light and easy to carry. With the reasonable pricing, it is ideal for the working population. Team RCHK-SIS, Kumar Bhaveshsai Bob from Renaissance College and Vasile Vladimir Vlado from South Island School planned to introduce a type of resistive exercise band to Iran. The band can be used individually for a range of different warm-up exercises, or used together with other fitness equipment, such as weights, to customize users’ workout routine. The team targeted to sell the product to teenage Iranians, providing them with more options of dynamic workout and stretching exercises. This year, six teams were shortlisted to present their strategies to enter the home fitness equipment market in Iran at the Hong Kong Final. They were required to present their products’ unique value propositions, pricing strategies, marketing plans, market entry options, and sales and distribution channels. The top three winning teams were chosen for the thoroughness of their market research and market entry plans, as well as creativity and entrepreneurial skills in entering the new market. Members of the judging panel included Andrew Wells, Board of Director, Por Yen Charitable Foundation; Anthony Leung, managing director, FedEx Express, Hong Kong and Macau; and Esther Ma, CEO and founder of Prestique Limited and board member of Junior Achievement Hong Kong. Now in its tenth year, the FedEx/JA ITC has inspired more than 14,000 students in Asia Pacific, including 2,063 students from Hong Kong, to understand entrepreneurialism from a global perspective. Designed to foster business knowledge through practical teamwork exercises and classroom learning, the FedEx Express/Junior Achievement program comprises two key activities: the International Trade Workshop and the International Trade Challenge. In Hong Kong, the International Trade Workshop was held on November 7, 2015 and May 7, 2016. More than 300 students participated and learned from speakers and business volunteers. The speakers shared both theories and real-life experiences to equip students with an understanding of international trade. In addition, FedEx employees volunteered as mentors to counsel students and guide them through the development of their plans. 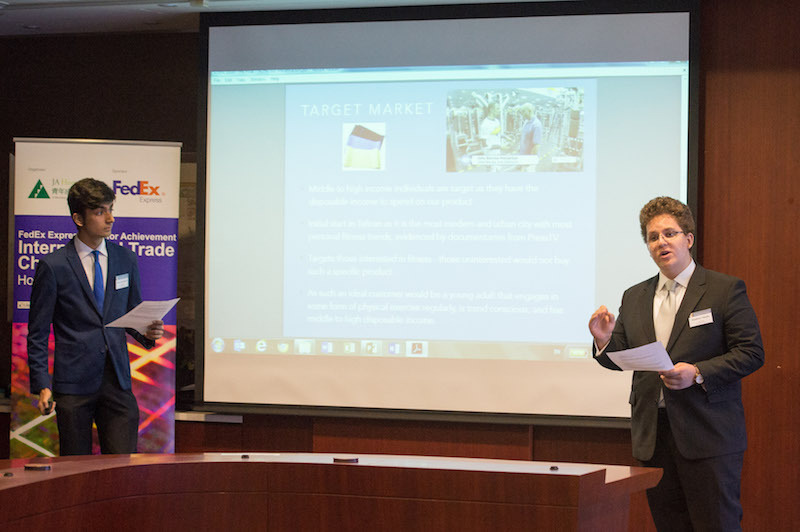 To enter the FedEx Express/Junior Achievement International Trade Challenge, students in teams of two had to develop a specific product or service and create an original international marketing plan for a designated country. Through this process, students gained first-hand experience of what roles world trade, product distribution and sales play in a market environment. In addition to teamwork, participating students learnt the basics of risk evaluation in the business world and gain confidence in their analytical ability. Junior Achievement Hong Kong is a registered charitable organization dedicated to inspiring and preparing young people to succeed in a global economy. In partnership with the business and education communities, JA encourages young people to participate in a range of activity-based education programs, designed to help them understand the world of work and develop the work readiness, entrepreneurship, financial literacy and other life-wide values essential for their future success. The Junior Achievement worldwide network now serves over 10 million students a year in over 120 countries. Since its establishment in Hong Kong in 2001, JA has engaged the support of over 18,000 business volunteers to serve more than 600 schools. Please visit www.jahk.org for more information.